Please choose your favourite language! Bitte wählen Sie Ihre bevorzugte Sprache! 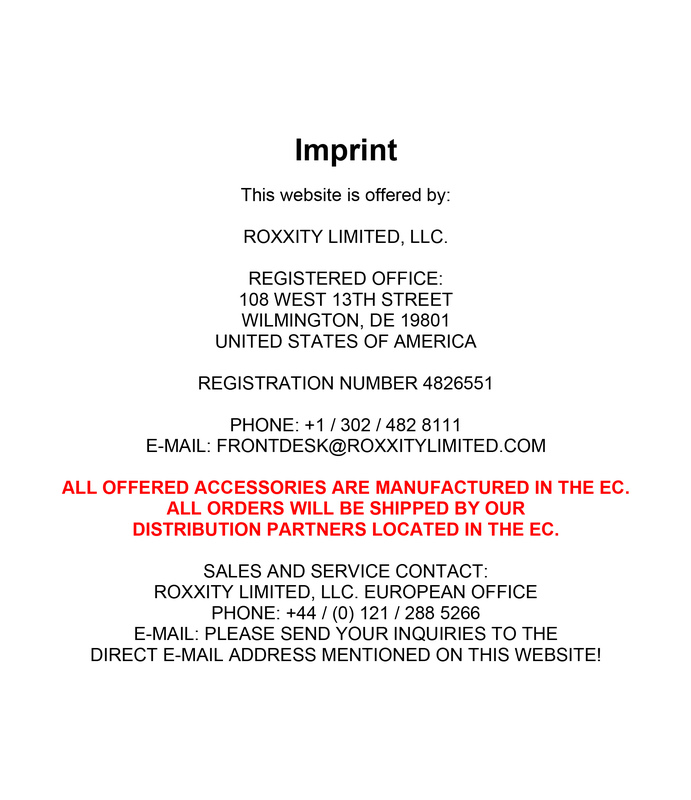 © 2019 ROXXITY LIMITED, LLC. Secure shopping without any risks! WE SHIP OUR PRODUCTS ALL OVER THE WORLD! SHIPPING EXPENSES REMAIN THE SAME WHEREVER YOU LIVE! 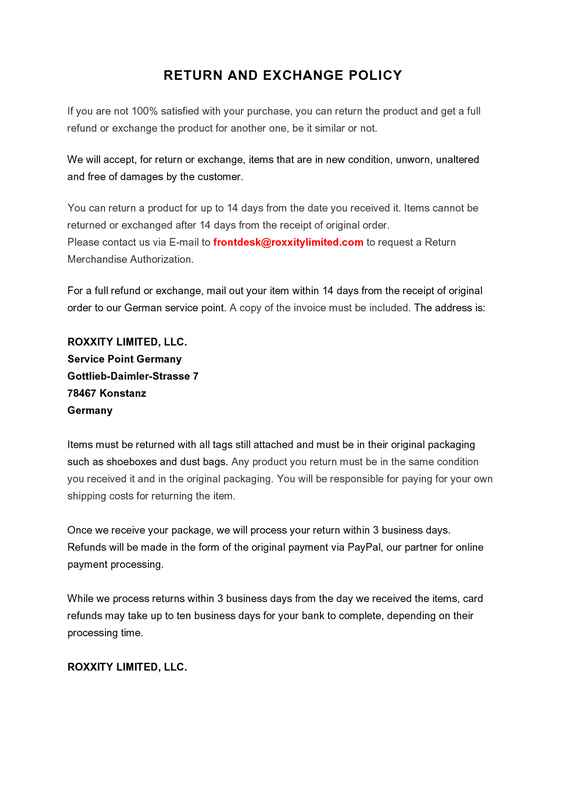 Please check before order whether certain customs or duty fees may be required for orders outside of the European Union! We are not responsible for any taxes, duties, broker fees or other customs fees and cannot be held liable for any such fees. - Pay via credit card: Just click on the "Add to Cart" button for the item you want to buy. Then the Paypal shopping cart opens. When you click on the "Proceed to checkout" button you will be directed to a site which gives you the possibility to pay via Paypal or via credit card. 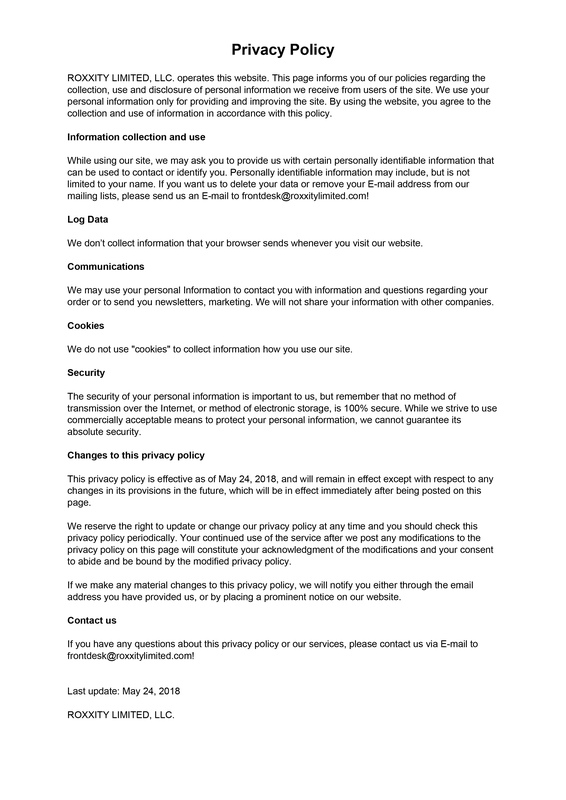 On the left side you will see the section "Don't have a PayPal account"? Use your credit card or bank account (where available)." Please click on "Continue" and you will be directed to a secure site where you can enter your credit card information. For your safety we also use the PayPal service to charge the amount to your credit card.You don't have to be a PayPal member to use this way to pay for your order! Your credit card data are only processed by PayPal for this individual order. We only get your order and address from PayPal to ship your items to you! Maximum safety for you! - Is there anything else we can do you? We appreciate your ideas and inquires. Please send us an E-mail at sales@nordschleife.us. We will reply as quick as possible! 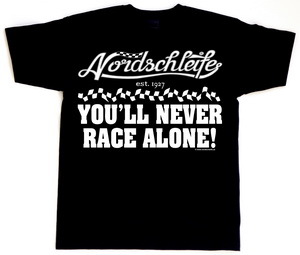 "Nordschleife® - YOU'LL NEVER RACE ALONE!" The Nordschleife of the Nürburgring has earned its reputation as the most difficult race track in the world over the last 90 years. The number of their fans is correspondingly large and many of them use every opportunity to take a ride on the the 20.832 kilometers long circuit. Black t-shirt with white XL size printing on the chest. Top quality (about 205 g/m², 100% cotton single jersey). Printed in the EC using environmently friendly and skin-friendly colours! Washable up to a maximum of 40 degrees Celsius. Available sizes: S, M, L, XL, XXL, XXXL. Heather-gray t-shirt"Nordschleife® - Gebirgs-, Renn- und Prüfungsstrecke seit 1927"
On June 18th, 1927 the Nordschleife was opened as a "Gebirgs-, Renn- und Prüfungsstrecke" (Mountain, Racing and Proving Track). On occasion of the 90th anniversary, our t-shirt with Nordschleife® lettering in old German typeface reminds of the long tradition of the world's most difficult race track. Light top quality (about 145 g/m², 97% cotton / 3% polyester single jersey). Available sizes: S, M, L, XL. 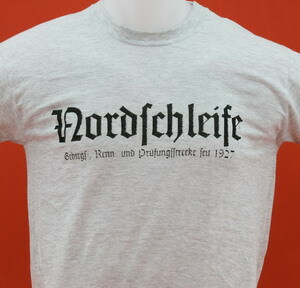 Attention: Our light "Nordschleife® - Gebirgs-, Renn- und Prüfungsstrecke seit 1927" t-shirts come a bit smaller than our regular heavy t-shirts of our other designs. We recommend to order these t-shirts one size bigger than normally required! 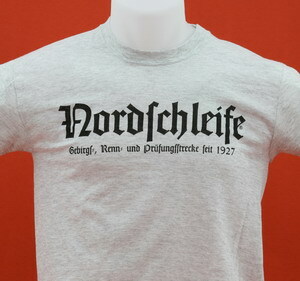 Heather-gray VINTAGE STYLE t-shirt "Nordschleife® - Gebirgs-, Renn- und Prüfungsstrecke seit 1927"
Greying with black printing in weathered VINTAGE style. Attention: Our light "Nordschleife® - Gebirgs-, Renn- und Prüfungsstrecke seit 1927" t-shirts come a bit smaller than our regular t-shirts of our other designs. We recommend to order these t-shirts one size bigger than normally required! 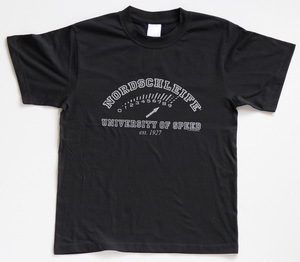 Black t-shirt "Nordschleife® RACERS UNLIMITED"
When you ask about the world's most demanding racetrack, there is just one answer no matter where you are on the globe: the Nordschleife of the Nürburgring. 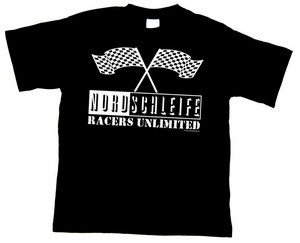 We unite the huge fan base of the "Green Hell" with our "Nordschleife® RACERS UNLIMITED" t-shirt! Black t-shirt with white printing on the chest. Top quality (about 200 g/m², 100% cotton single jersey) with double seams and reinforced seams on the shoulders for maximum comfort. "NORDSCHLEIFE® UNIVERSITY OF SPEED est. 1927"
The Nürburgring Nordschleife definitely is the world's most demanding race track and thus the toughest racing driver school. 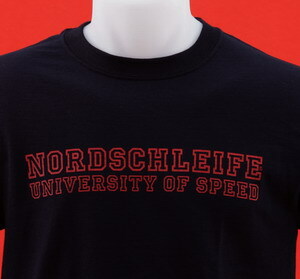 Wearing our "NORDSCHLEIFE® UNIVERSITY OF SPEED est. 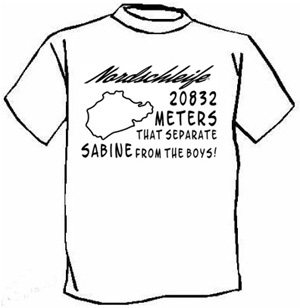 1927" 2.0 t-shirt you are demonstrating that you took your high speed examination in the Green Hell. Black t-shirt with silver coloured printing on the chest. 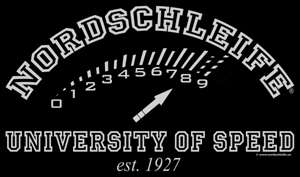 Wearing our "NORDSCHLEIFE® UNIVERSITY OF SPEED" t-shirt you are demonstrating that you took your high speed examination on the world's most demanding race track. Black t-shirt with red printing on the chest. Heavy top quality (about 200 g/m², 100% cotton single jersey) with double seams and reinforced seams on the shoulders for maximum comfort. Also available as Lady-Style t-shirt fitted to the waist in sizes XS, S, M and L! ONLY A FEW LEFT IN EACH SIZE! 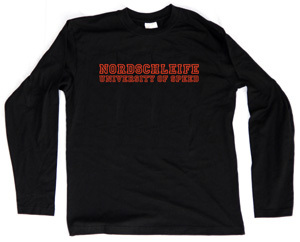 The perfect choice for cool days and nights: The Nordschleife® long sleeve shirt with red 'NORDSCHLEIFE® UNIVERSITY OF SPEED' printing on the chest. Black shirt with long sleeves and red printing on the chest. High quality shirt (190 g / m², 100% cotton) for great comfort at wearing. Wearing our "NORDSCHLEIFE® UNIVERSITY OF SPEED"hoodie shirt you are not only perfectly prepared for the cooler days on the Nürburgring. It is also designed to demonstrate that you took your high speed examination on the world's most demanding race track. Black long sleeve hoodie shirt with red printing on the chest. High quality (165 g/m², 100% cotton) with double seams on collar, sleeves and waistband. Taped neckline for maximum comfort. Available sizes: S, M, L, XL, XXL. Wearing our "NORDSCHLEIFE® UNIVERSITY OF SPEED" sweater you are not only perfectly prepared for the cold days on the Nürburgring. Black long sleeve sweatshirt with red printing on the chest. Heavy top quality (280 g / m², 80% cotton, 20% polyester). Elasticated waist and cuffs and cotton/elastane ribbed neck for greater comfort. Available sizes: S, L, XXL. NUR FÜR ERWACHSENE! ADULTS ONLY! 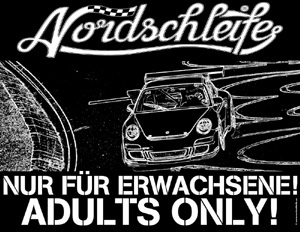 Black t-shirt "Nordschleife® - NUR FÜR ERWACHSENE! ADULTS ONLY!" The Nordschleife is the world's most demanding race track. 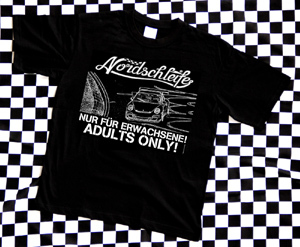 Equally true is the motto of our latest t-shirt: "Nordschleife® - NUR FÜR ERWACHSENE! ADULTS ONLY!" Black with white printing on the chest. High quality (180/190 g/m², 100% cotton). Extremely soft, maximum comfort. The vigorous logo of our "Nordschleife® est. 1927 Signature Line" pays tribute to the year 1927 when the world's most demanding race track was finished. Black with silver-coloured printing on the chest. Unfortunately this size is not in stock in the moment. Black shirt with long sleeves and silver-colored printing on the chest. Available sizes: M, L, XL, XXL, XXXL. 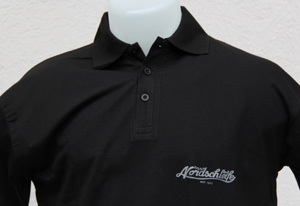 Black Polo shirt with silver-colored printing on the left side of the chest. Top quality Jersey (190 g/m², 100% cotton). Extremely soft, maximum comfort. 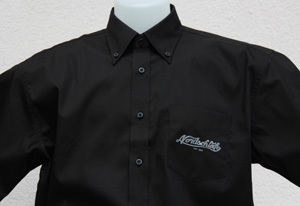 Black short sleeve shirt with silver-colored printing on the pocket. Top quality Jersey (140 g/m², 85% cotton, 15% polyester). High comfort. How do you call a racer on the Nordschleife, the world's most demanding race track? NORDSCHLEIFENATOR! 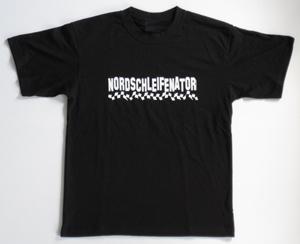 To make it easier to identify him or her we created the unique NORDSCHLEIFENATOR t-shirt! "Nordschleife® UNDER 10 MINUTES CLUB"
A lap time of less than ten minutes is hard to achieve on the Nordschleife of the Nürburgring. Then you are qualified to be a member of the 'Nordschleife® UNDER 10 MINUTES CLUB'. With this shirt you can show that you are an extraordinary driver or rider. Black t-shirt with white printing. Heavy top quality (195 g/m², 100% cotton single jersey) with double seams and reinforced seams on the shoulders for maximum comfort. 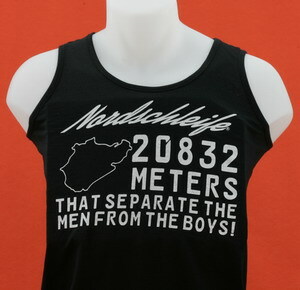 Here are our hot Nordschleife® muscle-shirts. A lap time of less than ten minutes is hard to achieve on the Nordschleife of the Nürburgring. 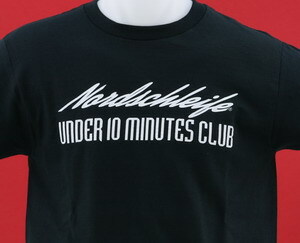 Then you are qualified to be a member of the 'Nordschleife® UNDER 10 MINUTES CLUB'. With this shirt you can show that you are an extraordinary driver or rider. 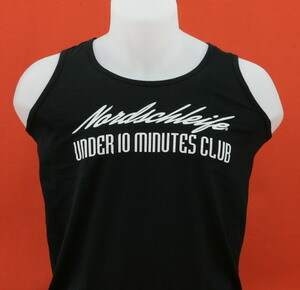 Black sleeveless muscle-shirt with white printing. High top quality (165 g/m², 100% cotton) for enhanced wash and wear performance with a softer feel. The shirt is side-seam free for added comfort. A lap time of less than ten minutes is hard to achieve on the Nordschleife of the Nürburgring. Then you are qualified to be a member of the 'Nordschleife® UNDER 10 MINUTES CLUB'. With this long sleeve hoodie shirt with large printing on the chest you can show that you are an extraordinary driver or rider. Black long sleeve hoodie shirt with white printing. High top quality (165 g/m², 100% cotton) with double seams on collar, sleeves and waistband. Taped neckline for maximum comfort. Our tribute to Sabine Schmitz, the Queen of the Ring! Nobody knows the 20832 meters long race track better than her! White t-shirt with black printing on the chest. Heavy top quality (185 g/m², 100% cotton single jersey) with double seams and reinforced seams on the shoulders for maximum comfort. Also available as Lady-Style t-shirt fitted to the waist in sizes XS, S, M, L and XL! The t-shirt for every fan of the "Green Hell". The legendary Nürburgring Nordschleife is the world's most demanding race track with a track length of 20.832 kilometers. Sorry! This size of our black t-shirt is not in stock in the moment! The t-shirt for every fan of the "Green Hell". The legendary Nürburgring Nordschleife is the world's most demanding race track with a track length of 20,832 kilometers. Olive-green t-shirt with white printing. Top quality (165 g/m², 100% cotton single jersey) with Cotton/Lycra rib crew neck with taped neckline for maximum comfort. Here are our hot Nordschleife® muscle-shirts for every fan of the 20,832 meters long 'Green Hell', the world's most demanding race track with a track. High quality (165 g/m², 100% cotton) for enhanced wash and wear performance with a softer feel. The shirt is side-seam free for added comfort. Available sizes: S, M, XL, XXL. 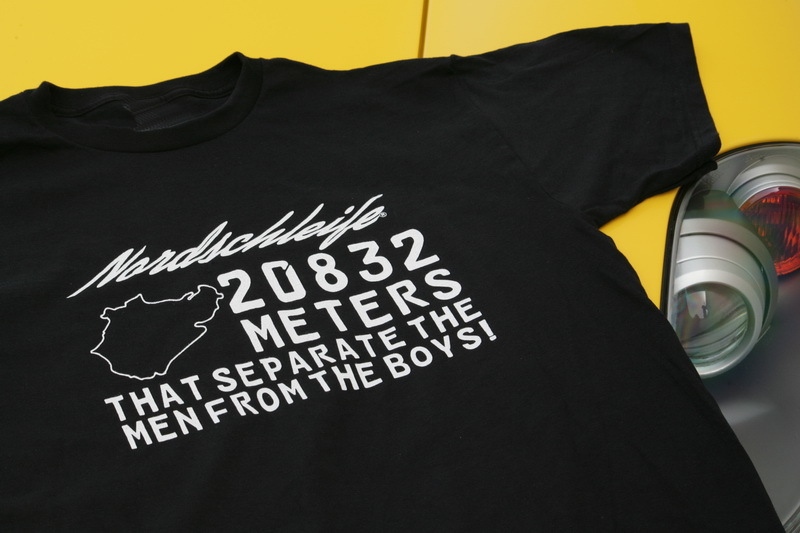 The perfect choice for cool days and nights: The Nordschleife® long sleeve shirt with large 'Nordschleife® - 20832 METERS THAT SEPARATE THE MEN FROM THE BOYS' printing on the chest. Black, light shirt with long sleeves and white printing on the chest. High quality (190 g / m², 100% cotton) for great comfort at wearing. 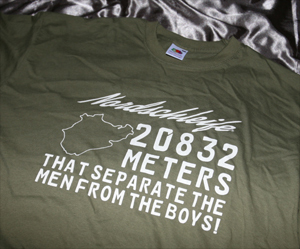 The long sleeve hoodie shirt for every fan of the 20,832 meters long 'Green Hell'. The legendary Nürburgring Nordschleife is the world's most demanding race track with a track length of 20.832 kilometers. Black long sleeve hoodie shirt with white printing on the chest. Wearing our 'Nordschleife® - 20832 METERS THAT SEPARATE THE MEN FROM THE BOYS' sweater you are perfectly dressed for the colder days on the Nürburgring. Black long sleeve sweatshirt with white printing on the chest. Every Nürburgring enthusiast knows: You should always be prepared for cold temperatures at the Nürburgring. 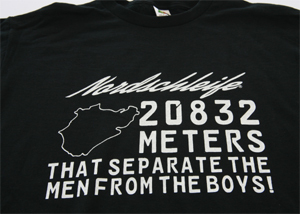 That's why we also offer a high-grade hoodie jacket with "Nordschleife® - 20832 METERS THAT SEPARATE THE MEN FROM THE BOYS" printing on the back. Black hoodie jacket with white printing on the back. Heavy top quality (about 280 g / m², 70% cotton, 30% polyester). Jacket with zipper. Hood with black draw cord. Two front pockets. 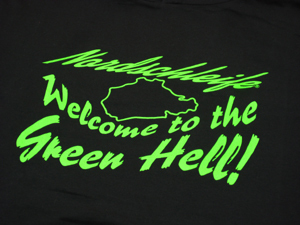 "Welcome to the Green Hell"
SUPER SALE SPECIAL PRICE: Black t-shirt "Nordschleife® - Welcome to the Green Hell"
Around the globe the Nordschleife of the Nürburgring is also known as the "Green Hell". 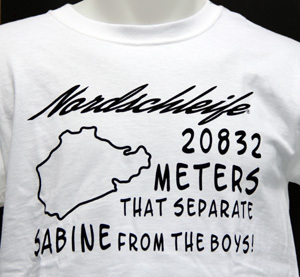 This is also the motto of this t-shirt from our Nordschleife® collection. Black t-shirt with luminous green printing. 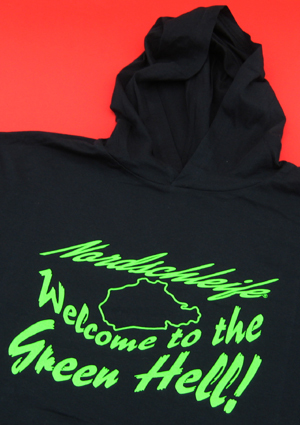 SUPER SALE SPECIAL PRICE: Black Long Sleeve Hoodie Shirt "Nordschleife® - Welcome to the Green Hell"
Around the globe the Nordschleife of the Nürburgring is also known as the "Green Hell". 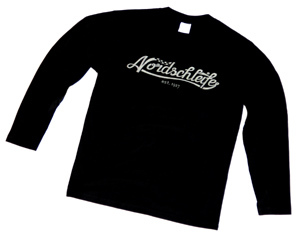 This is also the motto of this long sleeve hoodie shirt from our Nordschleife® collection. Subject to change without prior notice! 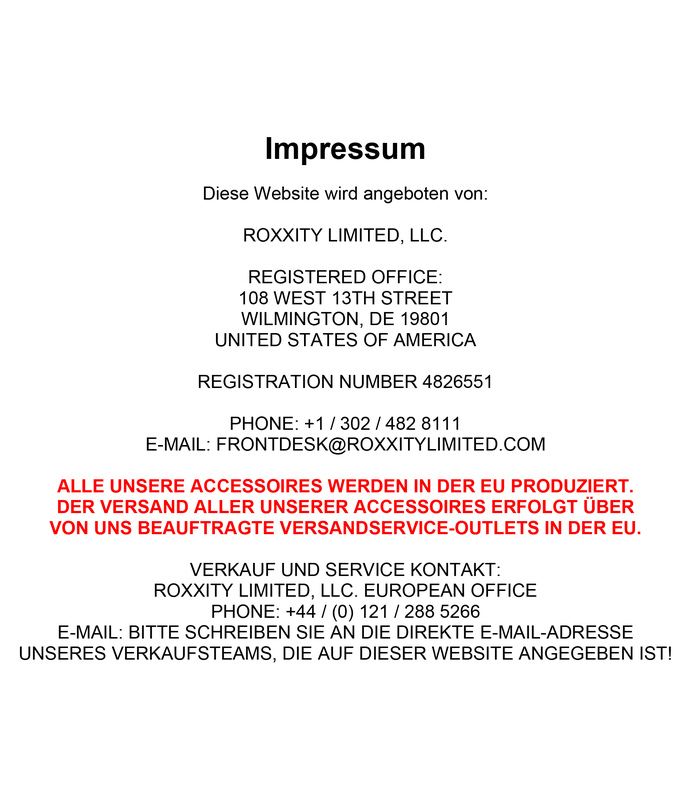 Nordschleife® is a registered trademark of ROXXITY LIMITED, LLC.